A troubled couple moves with their daughter to a countryside home haunted by a dark presence with murderous intent. October 31, 1957 – Two costumed trick-or-treaters knock on the door of Andrew Keating, principal of the local elementary school. The kids enter the dark house and are heard screaming. July 7, 2014 – In order to work on their marriage, Kelly and Brian move from San Francisco with their young daughter Sarah to the countryside home formerly owned by Keating. Kelly and Brian are welcomed by their new neighbors Clark and Ellen. Brian sees Ellen as an attractive young woman and lusts after her from afar. Still struggling with jealousy issues related to Kelly’s career as a massage therapist, Brian is immediately wary of Clark, whom he sees as an attractive man. Marriage counselor Dr. Sanders tasks the couple with regularly recording private video journals as a therapy exercise. Kelly, Brian, and Sarah soon start hearing strange voices and seeing shadows moving throughout the house, including visions of the trick-or-treaters from 1957. Sarah begins behaving oddly. Brian has a vision of Kelly lying murdered from a knife wound in the living room and slowly starts a mental breakdown. Sarah goes missing during the night. Kelly and Brian find their daughter wandering outside in a daze. The next day, they find Sarah’s pet birds decapitated and wonder if Sarah did it. Kelly’s sister Jamie and her son Mason visit. Sarah shows Mason evidence of paranormal activity that leads Mason to become momentarily trapped in the basement. Brian thinks he sees Jamie going into the guest room with Clark. Brian accuses Jamie of cheating on her husband, which angers Kelly and compels Jamie to suddenly drive away with Mason. Ellen visits Brian’s workshop outside where he spends most of his time and seemingly seduces him. Brian’s breakdown worsens. Kelly experiences a vision of a family in the dining room and tells Brian she fears their home could be haunted. Brian accuses Kelly of deliberately sabotaging their move to a new home in order to return to the city, leading to a distressing argument about the future of their relationship. Kelly has a psychic, Adelaide, come to the house. Adelaide detects the dark presence of a soul collector determined to murder those who occupy the home and rushes outside in fright. A deadly bee swarm suddenly attacks Adelaide inside her car and she is later taken away in an ambulance. Despite Kelly’s insistence, Brian still refuses to leave the house. Sarah vanishes. The police come to the house and find Sarah sealed inside a hidden room behind a basement wall. Officer Hicks recounts the story of the missing children from 1957. He explains that the children were found dead two weeks later, still dressed in their costumes. Hicks’ policeman father found suspect Andrew Keating barred inside the secret room, having starved himself to death. Officer Hicks also tells Kelly to look into the story of a woman named Ruth Wallace. Kelly visits Ruth Wallace in jail. Ruth explains that the presence in the house got inside her mind and drove her to poison her family. She adds that the only safe room is the one in the basement and warns that Kelly’s husband will be similarly driven to murder Sarah. Kelly races home as Brian threatens to harm Sarah over the phone. Brian traps Kelly in his workshop, but she uses an ax to break out. Once free, Kelly sees the house engulfed in flames. She finds her daughter safe and takes Sarah across the street to Clark and Ellen, who are revealed to be an elderly couple. Kelly tells the police that she believes Brian, possessed by the evil force, intentionally died in the fire to stop himself from harming Sarah. The police suspect Kelly killed Brian over their troubled marriage for a $3 million life insurance policy. One Year Later – A new family moves into a new house built on the property. The daughter appears to sense a paranormal presence in the home. Being a Lifetime Network original, the hitch to “House of Darkness” is recognizing that it is a movie made to slot in between “Seduced by My Sister’s Husband” and “I Swiped Right on a Stalker.” The target demo is casual viewers accustomed to made-for-cablers concerning social media nightmares and incestuous family melodrama, as opposed to dyed-in-the-wool horror fans eagerly eating up a “Saw” marathon over on Chiller. Keeping that in mind, it stands to reason that as far as haunted house thrillers go, “House of Darkness” is understandably going to be toned down, tame, and safe enough for Sunday night prime time. Fine, though that shouldn’t mean the movie has to settle for being the pedestrian production that it is. Kelly and Brian have a troubled marriage. Looking to escape the stress of the city, the couple packs up with young daughter Sarah and trades the fog of San Francisco for a quiet country getaway. They don’t yet know that their new home was the site of two horrible crimes and locals still whisper about a dark presence driving its occupants to murder. But Kelly and Brian are about to find out firsthand when paranormal activity amps up and odd behavior becomes ordinary for a husband, wife, and child taking a slow descent into madness. Throw a dart anywhere on the board of typical haunting/possession tropes and you’ll hit something in “House of Darkness.” A little girl speaking to someone who isn’t there. A worried mother experiencing inexplicable visions of her own. A disbelieving husband poo-pooing all suspicions of evil entities as nonsense. An imprisoned mental case and backstory-blathering cop connecting exposition dots in the last act. 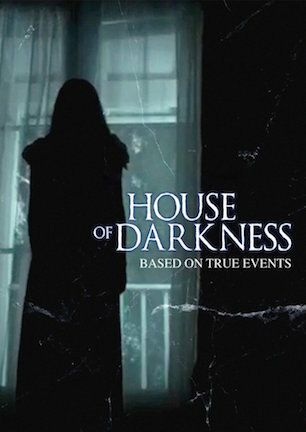 It’s possible that “House of Darkness” was written by a fictional character, too. Curiously, there currently isn’t a screenwriter credited on the IMDB entry, on Lifetime’s webpage for the film, or within the broadcast version of the movie itself. Perhaps the person(s) responsible aren’t itching for their association to be made public. Maybe Lifetime hopes people will be too hooked by the “based on true events” tagline to notice no one admits ownership of the script. What is the “true story” exactly? Who knows? The only hint offered by Lifetime is their vague promotional blurb, “recounts the mysterious case of a San Francisco family who claimed that a dark force was responsible for the tragic events that unfolded.” The story is so generic that there aren’t any worthwhile details specific enough to yield useful internet search results, either. On the other hand, betting men and women might suspect that any actual inspiration comes from Long Island instead of San Francisco. Brian’s transformation from jealous husband to potentially crazed killer comes complete with a continuously carried ax. Insects swarm someone summoned to investigate the haunting. A hidden room in the cellar holds sinister secrets. A possessive spirit drives inhabitants to kill their families. Pick up what the movie is putting down and you’ll soon sense the only ingredient missing is a foundation built on an Indian burial ground. The only other word needed for describing anything about “House of Darkness” is “average.” All of the strangeness happening in the house isn’t given context until close to the climax. There is no initial indication if the haunting has to do with horrible history, a vengeful ghost, occult rituals, etc. Scares are thus a hollow series of fleeting shadows, bumps in the night, and slow creeps in darkness. The movie goes through these motions of standard spooky movie construction, yet the lack of effort to go beyond such basics leaves the whole thing listless. It’s genuinely exciting to see Lifetime branching out of their bailiwick with more risqué genre efforts including “Flowers in the Attic” (review here), “Lizzie Borden Took an Ax” (review here), et al. “House of Darkness” has a similar spirit in its setup as PG-13 fright fare intended for an atypical audience. The movie is just so content to appeal only to those with a passing interest in supernatural thrillers that it cannot be anything other than milquetoast. May 4, 2016 by Ian Sedensky.